Welcome to the last post of Bay Ridge/Sunset Park! And I've saved (one of) the best for last. The store, which is owned by Ali Hamdan, opened in 2013 and was expanded in 2016. 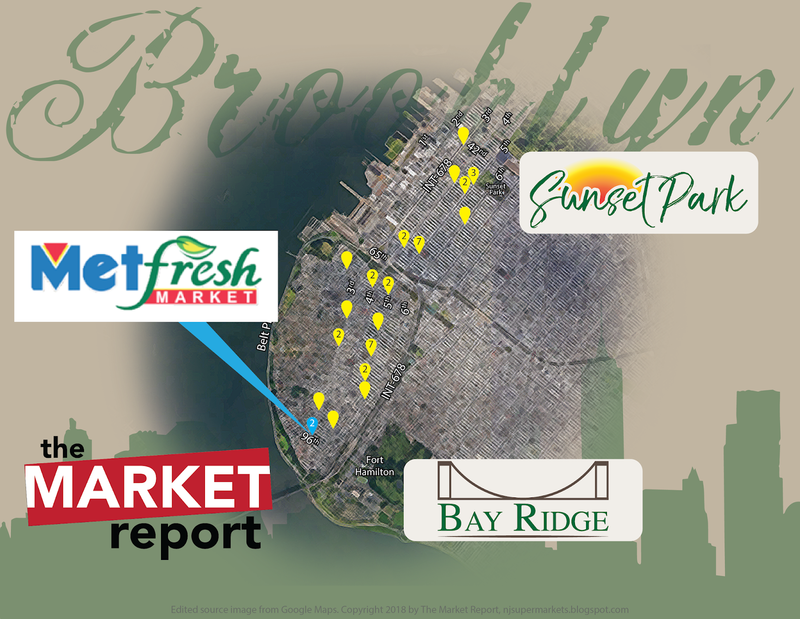 It was used as an example in this article about NYC's "hyperlocal" supermarkets -- a theme we've seen throughout this group of stores. I thought this would be a nice shot to begin with, with Met Fresh in front of the Verrazano Narrows Bridge. 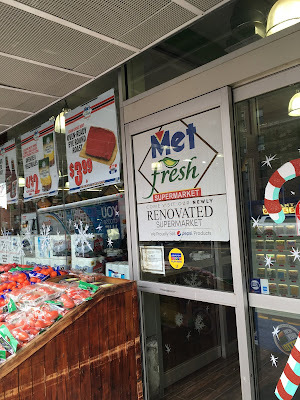 If you're a New York City supermarket, the best location you can have is on a corner like this. Maximum visibility in all directions! You can see where the store used to end, where the vertical brown stripe is visible on the facade. You enter to produce in the first aisles, with meat along the back wall, seafood in the far back corner, and deli/bakery in the last aisle. 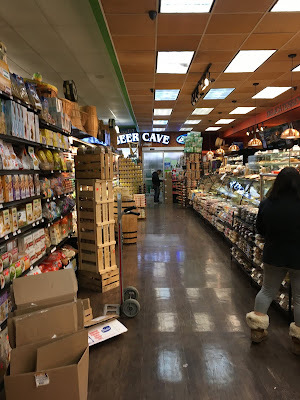 The store's famous Beer Cave is in the front corner opposite the entrance. This White Rose-turned-C&S truck was just pulling up as I was leaving, but I thought it would be a good place to point out the fact that C&S removed the White Rose logo from the trucks when they bought out WR, but did not replace it with anything. It's a pretty strange look. The store's design is quite striking when you walk in. Lots of bright colors and really well-done lighting! Quick look along the front end before we head towards the back of the store. The first aisle is produce, and the second aisle (shown here) is short, only about half the depth of the store, because the produce department takes up the front half. Met Fresh carries an interesting selection with some tropical products, as seen here, and some organic products. However, the emphasis is on the higher-end goods. Well, yes, the store does carry cheese. But no, it's not in that spot. Isn't that good enough for you? Just look at those beautiful greens and don't worry about it. The aisles are narrow, but not cluttered, which I really appreciate. Back aisle of the store, looking over towards produce. 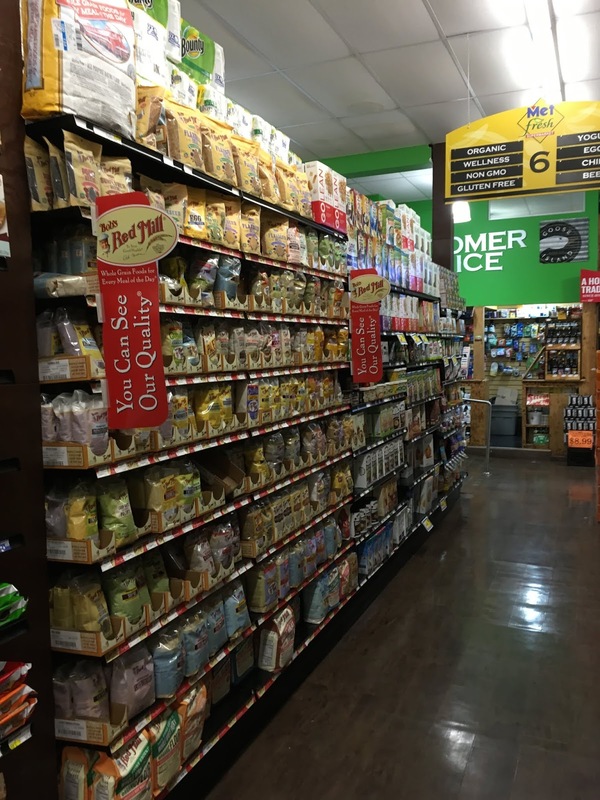 Part of the dairy section is in the general grocery aisles, because the store used to end here. I'm a big fan of the hanging pendant lights as well. Seafood, not yet open for the morning when I visited, in the back corner of the store. Deli and bakery in the last aisle. Here we're looking towards the front of the store and the Beer Cave. Warning, if you're hungry, please stop reading this post now. A sampling of the offerings in the bakery. On the one hand, the semolina baguette is probably delicious, but the other half of me just wants one of those cinnamon rolls. Moving over to the deli, we find the selections are no less impressive. Olive bar in the facing refrigerator case. I guess New York City is famous for its delis, but I was really impressed with the delis at this store, The Food Emporium, and Foodtown. The entire case wasn't filled yet because it was still early in the morning when I visited, but this deli is pretty great! Walk-in beer cooler at the front of the store, next to the deli. 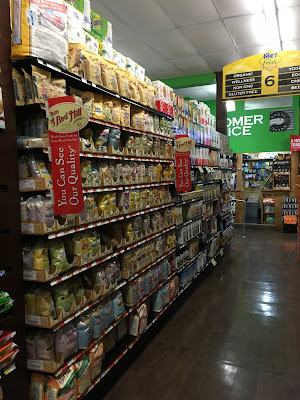 The one thing that Met Fresh does not really have, which both The Food Emporium and Foodtown do, is a large HABA selection. The only HABA Met Fresh has is behind the customer service counter here. 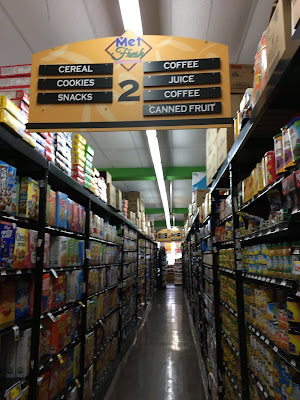 A look at the front end, before we wrap up our coverage of not only this store, but all of Bay Ridge and Sunset Park! But wait, there's more! Come back tomorrow and Wednesday for a few other random things that haven't made it into the group so far.